Horses are hooved mammals with barrel-shaped bodies and long legs. Horses are equines, along with zebras and donkeys. The more than 300 domestic horse breeds are descended from wild horses. One wild ancestor, the Asian Wild Horse, can be found on the Zoo’s Northern Trail. Horses are herbivores, or plant-eaters. With their long necks and specialized teeth, they graze for grasses in pastures or in the wild. Domestic horses generally eat a diet of hay or grass and grain. Horses need plenty of water, about 10-12 gallons per day on average. Horses live where humans do, except in Antarctica. Small, hairy Icelandic horses survive on arctic tundra, while Arabian horses are adapted to the desert. Wherever they live, horses both domestic and wild require grass and water. If allowed to graze, horses will spend several hours each day foraging for grass. In the wild, these social animals form bands or herds dominated by a powerful stallion. Both wild and domestic horses groom each other and communicate using body language, neighs, and snorts. In general, horses are doing well around the world. But some breeds, including the Zoo’s American Cream draft horses, are rare. The horse’s wild ancestor, the Asian Wild Horse, was nearly extinct and has only recently been reintroduced into the wild. Weight: 850 – 2400 lbs. ; 1000 lbs. avg. 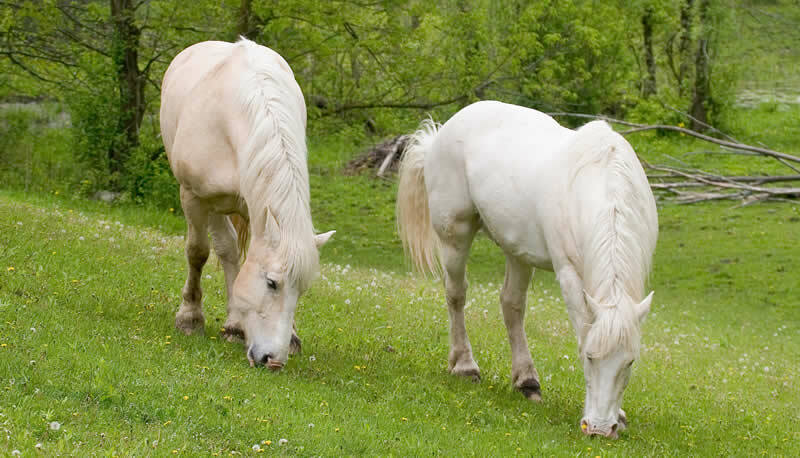 Two of the Zoo’s domestic horses are American Cream draft horses, that are a critically endangered breed. These horses are easily identified by their cream-colored coats and large, powerful bodies. The American Cream draft—brothers Duke and Prince—are recognized by many frequent Zoo visitors. They were born in Michigan: Duke in 1992 and Prince in 1993. The geldings worked for two years on an Amish farm before coming to the Zoo. Wherever English is spoken, people measure horses in “hands.” One hand equals 4 inches. A horse’s height is measured from the ground to the withers, the point where the neck meets the back. When Columbus came to the Americas, he brought horses back to the New World. Long before, the first horses lived in the Americas. During the Ice Ages, they migrated to Asia, then Europe and Africa. At the same time, they went extinct in the Americas. All horses in the Americas today are descended from Eurasian breeds. Horsepower measures the power output of something, such as a car engine. Engineer Thomas Watt came up with the term in the late 1700’s as a way of explaining how much power could be derived from a horse, compared to the typical output of new-fangled steam engines. American Cream draft horses are born with eyes that are practically white. Their eyes darken to an amber color during their first year of life. Nearly all American Creams can trace their ancestry back to one cream-colored mare, named Old Granny, who lived in Iowa in the early 1900s. Because they are calm, not skittish in crowds, American Cream draft horses are becoming popular with law enforcement for mounted police patrols.